According to the American College of Prosthodontists, tooth loss happens from decay and gum disease and as a result of injury, cancer, or simply wear. Approximately 25 percent of Americans over the age of 60 no longer have their natural teeth. This population often experiences nutritional deficiencies due to difficulty chewing and associated pain. If your parent is facing the need for dentures or has recently acquired them, they may have concerns and unaddressed fears. Here are some facts that can help you ease their fears and acknowledge the benefits. Your parent may feel frustrated initially due to discomfort and pain. It takes time for dentures to become comfortable. They may feel loose at first or their gums may be irritated. Suggest they give it two weeks before becoming too disconcerted. Gums require time to get use to dentures and the muscles of the jaw take time to adjust. If there is still discomfort, talk to their doctor. It’s important that they start slowly and increase the time they wear their dentures to ensure success. Taking them out when they sleep gives the gums time to heal and, by soaking the dentures overnight, reduces the possibility of fungal or bacterial infections. Dentists can help ill-fitting dentures by remaking them in order to get a better fit or inserting implants that stabilize the dentures. Dentures need to be cleaned properly. This entails scrubbing them nightly with a toothbrush specifically designed for dentures and using the appropriate cleanser. Soak overnight in water or a denture-soaking solution. If a solution is used, be sure to have them rinse prior to replacing their dentures. Rinse dentures after eating and brush the gums and mouth after removing. Medications and age can reduce the effectiveness of the saliva gland resulting in a dry mouth. This makes it harder for those with dentures. Taking sips of water throughout the day or promoting saliva by chewing gun can be helpful. 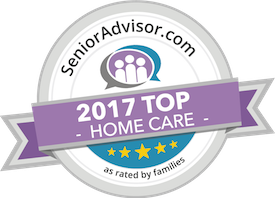 If you are using the services of a senior care provider, or are considering acquiring their help, know that they can help your parent with this transition. They can offer reminders about care and use. They can prepare healthy meals that are helpful when being introduced to dentures such as vegetable soups and omelets. They can provide transportation to dental visits as well as encourage conversation so your parent can get use to speaking with dentures. This will keep them socially engaged, a vital component to their health, and reduce the fear of speaking in public. Have questions about senior care in Kahala, HI? Contact the caring staff at All Care Hawaii today. Call Oahu (808) 206-8409 or Maui (808) 664-3853. Call us 24 hours a day, 7 days a week!